27.4.1914: Launched by Smith’s Dock Co Ltd, South Bank-on-Tees, Middlesbrough (Yd.No.576) for Fred Kelsall & Co Ltd, Fleetwood (Thomas F. Kelsall, manager) as CITY OF DUNDEE. 22.5.1914: Registered at Fleetwood (FD4). 11.1914: Requisitioned for war service as an auxiliary patrol vessel (Ad.No.678). Based Dover. 15.9.1915: At 7.10 pm. 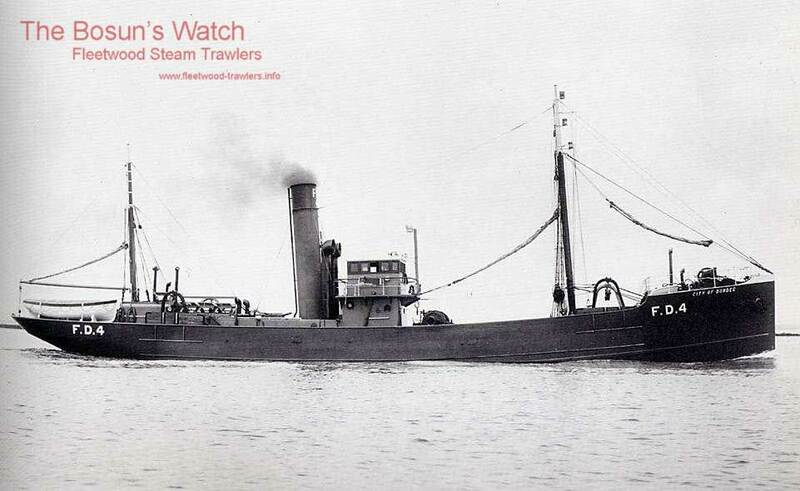 foundered after collision with steamer PATROCLUS (5509grt/?) at the Folkestone Gate. Officer in Command Lieut. Albert J. Coles RNR and seven men saved, six by PATROCLUS and two by steamer MISTLEY (135grt/?) . Remainder of crew, Warrant Officer Telegraphist, RNR and six men, lost*. 18/05/2012: Page published. 5 revisions since then. This entry was posted in Lost Vessels, Steam Trawlers, Steamers (Picture), War Losses and tagged Fred Kelsall, Lost, War Loss on May 18, 2012 by Fred Smith.